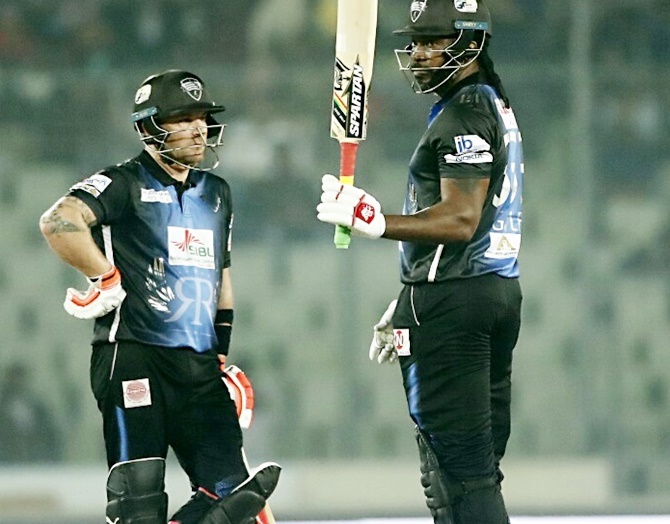 Chris Gayle hit 18 sixes on his way to an unbeaten 146 off 69 balls for Rangpur Riders against Dhaka Dynamites to create Twenty20 cricket history in the Bangladesh Premier League final on Tuesday. Gayle, who was dropped by Shakib Al Hasan on 22, broke the record he set when he smashed 17 sixes in an unbeaten 175 for Royal Challengers Bangalore against Pune Warriors in the Indian Premier League's 2013 final. The 38-year-old Jamaican's knock also took him past 11,000 runs in the shortest format of the game and made him the first player to score 20 centuries in T20 cricket. Gayle, who has now struck 819 sixes in T20 cricket, last played a T20 international for West Indies in September and his last test match was against Bangladesh in 2014. His unbeaten 201-run partnership with New Zealand's Brendan McCullum steered Rangpur Riders to 206 for 1. Remember the English cricketer who proposed Virat Kohli?